I don't use thread often but I found myself with a few projects this holiday season that I wanted to try and realized I'd misplaced my Bates Bamboo crochet hooks and so far a search has not found them. What is worse is when I went to replace them I can't find them anywhere in store or online. It appears they have been discontinued. I'm ordering an additional set of the regular Bates Bamboo as they are the most comfortable set for my hands. 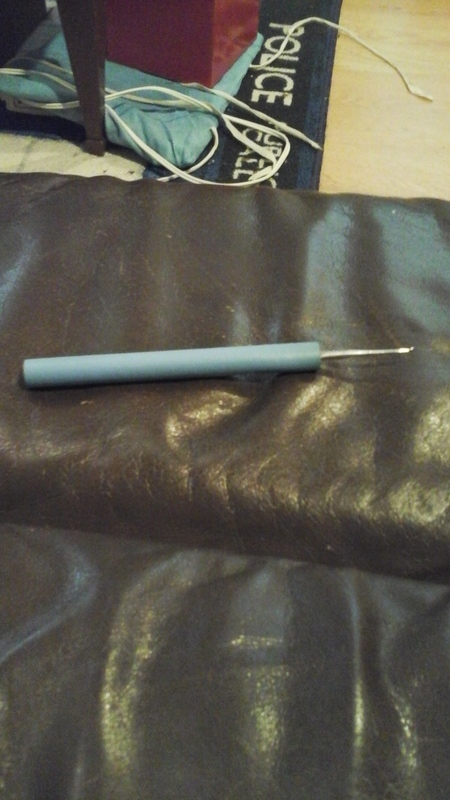 However, I'm stuck on what to replace my thread crochet hooks with and am looking for some suggestions. The Bates Bamboo are the only thread crochet hooks I've ever had any success with as they made the handle longer and wider and thus easier to hold and maneuver. I'm hoping to find a replacement set that has a round handle not flat. The Addi hooks are too big for me to use. I want a metal not plastic hook if I can find it. Has anyone tried the Hobby Lobby bamboo hooks? I came across them yesterday while doing an online search and wondered if the hooks were closer to Bates heads or Boye. Bates works more naturally for me, but I may have to adjust if the handles are close enough to the Bates handles I have now. Thanks for any feedback on any brands that might be a good replacement. I have foam tubes/straws that fit around the thin thread crochet hooks. They are in the craft store near the hooks usually. I've got a Boye interchangeable set, which really helps as my fingers get older and creakier. The shaft is something like a G hook size, and different steel sized tips screw into it. https://www.amazon.com/Boye-Interchangeable-Head-Crochet-Steel/dp/B00BKF68GE That's a good price for 14 hooks! I can't remember what I paid, but I'm sure it was more than that. You might look around on the Lacis site as they carry some unusual hooks http://www.lacis.com/catalog/ Among other things, they have steel sizes of Clover Soft Touch and Amour. I have several Amour thread hooks and haven't used them much but they are well made and have a nice handle, at least for me. Joann also carries the Amours in steel sizes and apparently these are available in some of their stores, as well as online. That's a good price for 14 hooks! It's a really sturdy case--but light, some sort of dense, almost rubber-like stuff, with a depression and label for each tip and the handle. Really nice! I miss using some of my gram's old hooks (Boye hooks, marked 5¢ and 10¢ , probably from the 1920-40s? ), but these are so much easier on the hands. I appreciate the input ladies. I had a true Christmas miracle after months of searching I was moving something on a shelf I had cleaned off months ago looking for my hooks and lo and behold I found the box with my hooks. I am so grateful. I have tried the Armour and the Clover and the flat sided hooks just aren't right for me. I had heard of the Tulip Etimo and had hopes for those too but again just not the right match. I am thinking about trying out the Hobby Lobby version of the Bamboo Steel hooks although I'm not sure what type of hook (Bates vs Boye) as I'm I'm a Bates girl.they have. I just like the round hook and the size in my hand. I was gifted a prefoamed hook that looks about that size and I just find something a little bigger easier on my hands, which is why the Bates Bamboo has been a good match. I have big hands and the smaller hooks cause cramping in my hands. Ironically, I was really excited to try the Addi Swing hooks but it was the Goldilocks syndrome, they were just to big to manage. I ended up sending the one that was given to me on to someone else who requested them back when we had the gift lists.